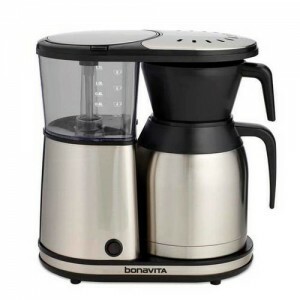 As you may have seen, we recommend a specific coffee brewer, the BonaVita 1900TS, if you are looking for an auto brewer at home. This is also the standard that we use here at Roast Ratings for all of our brew evaluations (to learn more about our full rating process look here). All of these coffee brewers meet the SCAA standards for great coffee and have been certified as such. Beyond that, some brewers performed better than others in various categories. The following notes show where each brewer met, exceeded, or didn’t live up to our expectations. The Behmor Brazen Plus brewer was a pleasant surprise when we opened it up. It boasts very solid construction with high quality materials throughout. Behmor a company that is known for its home coffee roasters. The brewer operates by placing cold water in the top chamber, which is then boiled and cooled to the desired temperature before being released over the bed of coffee grinds. Uses a standard 8-10 cup flat-bottom paper filter OR its own metal brew basket, which comes with the brewer. The water sprays a little to the right side each time, though this may be because of the valve in the coffee funnel pushing up when the carafe is in place for brewing. For the record we used a paper filter. Not the easiest brewer to use. There are a huge number of options, buttons, and settings with this brewer, which is nice to have but somewhat complicated to set up. This was the second most expensive brewer on the list, coming in at $199. The flavor was appropriate for the beans, flavor notes were clean and mostly well defined. We rated this brew in 2nd place. Pros: Excellent construction and materials, ability to control brewing temperature, elevation setting, brew timer (to automatically begin brewing), quality water spray and resulting brew. Cons: Long brew time (takes @8-10 minutes to brew a pot), slightly off-center water spray, somewhat complicated programming, very tall and must have access to top chamber (doesn’t fit under a standard kitchen cabinet well). Bottom line: The Behmor Brazen Plus is a solid and well designed brewer. With the ability to tweak your brew recipe, water saturation time, temperature, or overall brew time, this brewer is a coffee geek’s dream. 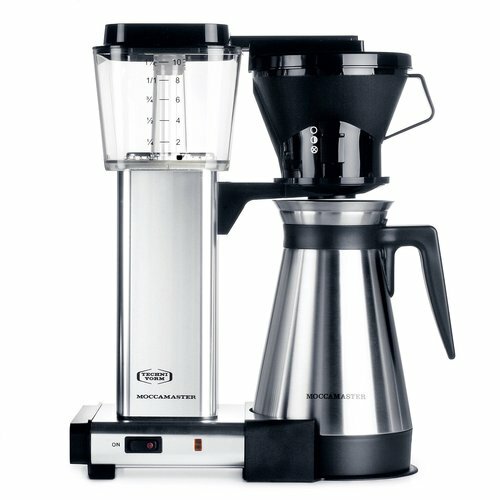 The Technivorm Moccamaster is the first home coffee brewer that received the SCAA certification. It has been considered by many to be one of the best brewers on the market. This brewer works by quickly heating the cold water from the reservoir, which is then piped to fall over the bed of coffee grinds. Uses standard #4 paper cone filters. No. The center of the cone is saturated, with mostly dry grounds in the perimeter. This result happened every time we brewed. Some level of manual intervention is needed to create a fully saturated brew. The water spray is akin to a dribble, providing no turbulence and rather varying brews. The brew button is a simple press, though a lot of individual parts must come together to brew properly. Again, if an ideal brew is desired the user needs to give more attention to the details. The many pieces are designed for easy cleaning. The flavor tasted more over-extracted and bitter than the others. The identifiable notes became muddled and unclear. We rated this brew in 4th place. 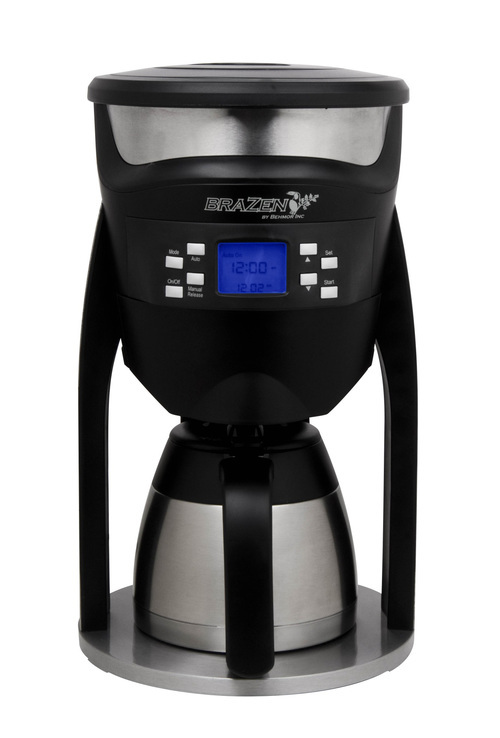 Pros: Solid construction, easy to clean, one button brewing, quality carafe with easy pouring options. Cons: Expensive, poor water spray and resulting brew, small parts may be easy to misplace, not as many brewing options. Bottom line: The Technivorm Moccamaster KBT 741 is well built, with an excellent history of reliability. Extra attention and interaction in regard to the brew details is needed for the best output. The higher price is reflected by the known longevity of this brewer. 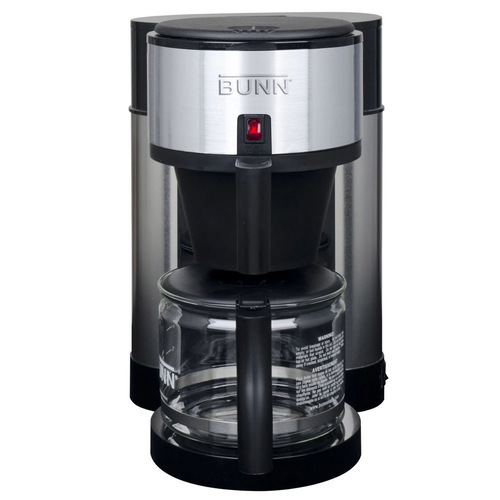 The Bunn Velocity brewer is a value option for home coffee, with lightweight plastic construction and a glass carafe. This brewer is intended for regular (daily) use. It works by holding a set amount of pre-heated water (about 2 liters) in its boiler, which is then displaced by fresh water. The result is simple. You get (roughly) the same amount of water out as you poured in. There is a “vacation button” to turn off the heat in the case of more than 3 days without brewing. Came with flat bottomed paper filters that looked different than standard, but the 8-10 cup flat paper filters we had in stock worked just fine. Yes. Grinds are saturated, though the spray of water hits some areas more than others. The brew is consistent in the cup. Seems to replicate results well. The biggest difficulty is prepping the water in the boiler. After the water boiler has been filled, using this brewer is simple due to the displacement system. The brewing itself is simple. The flavor was good. Slightly thin in comparison to the other brews, with muddled flavors. We rated this brew in 3rd place. Pros: Inexpensive, fast brewing, low profile (fits under a kitchen cabinet). Cons: Less sturdy construction, water is not fresh in brew, heating plate for glass carafe (tends to burn your brew), few brewing options, “cup” measurement seems to be a larger size. Bottom line: The Bunn Velocity Brewer is fast and effective. It is easy to make multiple pots of coffee, though less reliable in the brew parameters for maximizing the coffee quality. The build quality reflects the price. The newer version, the Velocity BT, may have improvements. The 1900TS is one of the latest offerings from the BonaVita company. This model is upgraded to use a flat dripper cone rather than the previous conical shape. This brewer works by quickly heating the cold water from the reservoir, which is then piped to fall over the bed of coffee grinds. Uses standard 8-10 cup flat bottom paper filters. Yes. Grinds are fully saturated and thoroughly wet after brewing. Well designed water spray and simple mechanisms seem to create very good replication of brews. Brewing is a simple button press, biggest difficulty is the dripper cone which sits on top of the carafe rather than sliding into the machine itself. Also of note is the fact that your really can’t pour from the carafe without placing the pour spout lid on top first. On a plus note, it allows the use of other brew devices, such as a Chemex, in place of the standard carafe. This was the second least expensive brewer on the list, coming in at @$179. The flavor was clear and defined. It fully extracted the coffee, which was sweet and fruity. We rated this brew in 1st place. Pros: Simple one button brewing, optional pre-infusion setting, low profile (fits under kitchen cabinets easily), excellent water spray and resulting brew, easy to clean. Cons: Thermal carafe doesn’t hold temperature as well, carafe is difficult to fully empty, construction is less sturdy than some others, not as many brewing options. Bottom line: The BonaVita 1900TS is a balance of lower price and quality brewing. The construction is not quite as solid as some of the other models, but good enough that it doesn’t feel cheap. A great brew that is simple to achieve. After all of this testing and tasting we felt that the BonaVita brewer was the clear winner. The brews were consistently the best, it is very easy to use, and the price point is reasonable. When we approached BonaVita about using their brewer in an official capacity, they were happy to be a consumer resource and already have every intention to make improvements to their products. As time passes we will keep trying brewers and plan to implement new advances made by BonaVita in our brew evaluations. At the end of the day, we of course want the absolute best representation of brewed coffee for our ratings, and will make the choice of a brewer based on the the results in the cup. That’s what it’s all about after all! We are checking with Bonavita and will have an answer for you soon! If you want the French press process, but with a modern twist, there are a couple of new brewers on the market that have made some interesting tweaks to the traditional design. If you like an elegant stainless steel design, check out the Espro . Or, for something more sturdy you can take on your travels, take a look at the Impress coffee brewer .